According to Ulrich Hintermair, who conducted research in his lab as a postdoctoral fellow for the past two-and-a-half years, Crabtree’s concern with his research team’s wellbeing is just one of many qualities that distinguish him as a mentor at Yale. Crabtree was honored in a campus ceremony this summer with the 2013 Yale Postdoctoral Mentoring Prize, which is awarded to the faculty member who is judged to have had the greatest positive impact on his or her postdoctoral appointees. Faculty members are nominated for the honor by postdoctoral scholars, and a committee appointed by Provost Ben Polak selects the prizewinner. The prize includes a cash award and a plaque. Hintermair — and other past and current postdocs who nominated Crabtree for the honor — also singled out his enthusiasm for science; his consistent engagement in their lives and work; his wise advice on matters both personal and professional; his vast scientific knowledge; and the guidance he’s given to help them become better scientists. “He is famous for welcoming new group members with ‘What do you want to do in the future? I need to know as soon as possible, because it is my job to get you there,’” wrote Hintermair in his nomination letter. “I’ve never heard of any adviser taking mentoring that seriously and personally. “And I’m lucky; I get very high-quality students,” he adds. Crabtree is a world-renowned organometallic chemist whose research on alternative energy sources — particularly the conversion of energy from renewable into usable form — has resulted in groundbreaking discoveries. He receives about three applications a day from graduate and postdoctoral students interested in working in his laboratory, and he is able to hire only one of these candidates every two or three years. The postdocs lucky enough to be chosen to work in Crabtree’s lab report that he is a genial leader who stands back to let them pursue their own research interests. Likewise, he says, he assesses the personalities of those he mentors and then guides them accordingly. Born and educated in England, the son of a film director and a dancer, Crabtree says that his own interest in science began in early adolescence, a time when he started borrowing scientific textbooks from the library, learning things that were not taught in his school. He recalls several teachers who particularly influenced him as a student. Malcolm Green, his undergraduate supervisor at Oxford University, was passionate about science and bold enough to tackle any new experiment, he recalls, while Joseph Chatt of the University of Sussex (where Crabtree earned his Ph.D.) taught him to pay close attention to detail. While he was a postdoctoral fellow at CNRS, in Gif-s-Yvette, France, in the early 1970s, his mentor Hugh Felkin taught him essential scientific techniques of value in his work in organic and inorganic chemistry. “The combination of these attributes — being bold and enthusiastic, paying attention to minute details, and knowledge of useful techniques — has not only helped me in my career but has, unconsciously I’m sure, shaped the way I mentor my own students,” comments Crabtree. Those who nominated Crabtree for the Yale Postdoctoral Mentoring Award noted that their mentor’s influence extends beyond science, and many claim he has also made them better people in general. Several of his mentees also noted that the door to Crabtree’s office is always open, and that he encourages his postdocs to come in for any kind of discussion. “I’m a lover of books, especially 18th- and early 19th-century British literature, and occasionally my students or postdocs are interested in that, too, so we have wonderful conversations,” he says. Crabtree — who has traveled extensively with his wife throughout Africa and to parts of South America — enjoys having conversations with his mentees about their home countries (and occasionally dining with them at ethnic restaurants). Some of his international postdocs and graduate students, he says, have invited him for visits to their homes, where he has had the pleasure of meeting their families. One of his greatest pleasures, he says, is when a young member of his team makes an important scientific discovery, or enlightens him with new information. “Teaching at Yale, I’m in contact with highly intelligent people,” he says. “They often come to me with counter-arguments, or make a very important discovery. So it is not just me teaching them, but them teaching me. 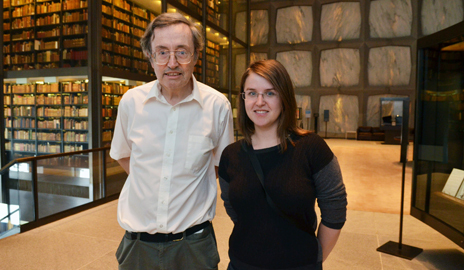 Oana Luca, who earned her Ph.D. in chemistry in May, was among the mentees who attended the Postdoctoral Mentoring Prize ceremony in honor of the Yale scientist. Having worked in Crabtree’s lab for five years, she acknowledged that she was not eager to end her connection with her mentor and the members of his team.